I’m so glad I invested in the Hamilton Beach personal blender. It is a great little blender for making smoothies. I have a Ninja Master Prep (QB900B) smoothie maker with a regular pouring spout which is perfect for breakfast smoothies with family, but I also want the practical function of a portable blender. It makes a delightful smoothie with virtually no small bits of fruits, vegetables, or ice left in the pitcher. This is a great blender that pulverizes the ingredients to produce a smoothie consistency without needing to rely on a full-size blender. My personal blender is easy to clean with its no disassembling design and gives the complete convenience to drink directly from the blender cup – this eliminates a need to wash extra dishes, I can just slide open the lid and use a straw. 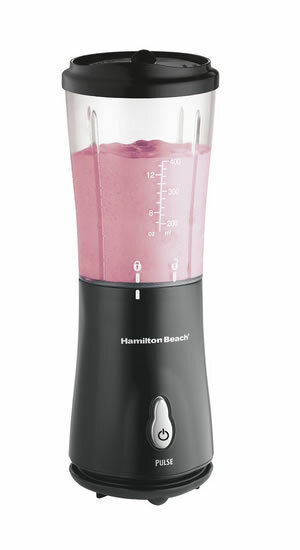 This Hamilton Beach personal blender is available at less than $15 so unable to provide the performance of a 15-speed extremely powerful and strong unit, but I still love the design of this model. My blender is used for smoothie making and it is just perfect for this and I have zero problems. This appliance blends perfectly and then it’s possible to grab the jar and leave home. I can honesty recommend this personal blender for anyone after a single on-the-go option. Even though it isn’t that bad, this blender can emit a slight burning smell after a prolonged spell of use. I prefer the blending technique of blend for several seconds, wait, and repeat until the preferred consistency is achieved. Blending like this usually helps to get rig of the burnt smell. Difficulty of cleaning this blender can vary with when it is clean. Clean immediately after use to get the best results. But if you leave the blender to sit and the ingredients start to dry it can be difficult to clean the area at the bottom near the blade. If your aim is to blend fresh and frozen smoothies at home this is certain to provide an efficient and affordable option. But f you want something more heavy-duty, then consider investing in a Ninja Master Prep (QB900B) or Magic Bullet (NBR-1201R) NutriBullet. Can emit a burning oil smell during extended use… but this does sound worse than it is. The Hamilton Beach 51101BA Personal Blender has a List Price of $19.99 and Best Price of $14.85 (subject to change) which puts it in the highly affordable category for kitchen appliances.